Archos has unveiled the ARCHOS Drone. Demonstrated later this week at IFA 2016, available in October 2016, this ready-to-fly little machine has an altitude of up to 50 meters at a speed that can reach 7.7 m/s during at least 7 minutes, for pure fun or exciting HD footage that isn’t possible any other way. Thanks to its dedicated Controller or the Remote App, available on the Google Play Store and Apple iTunes Store, the ARCHOS Drone will satisfy beginners willing to gawk at the world’s beauty, for £79.99 (UK). The ARCHOS Drone is light (135 g) and robust, with its eight propellers (four spares), two landing gears, and four protection guards. It offers great maneuverability and its propellers are even replaceable in case of damages, which is particularly suitable to newbies. With its 6 axis gyroscope and its accelerometer, it features all functions for a nice flight, inside or outside: take off, landing, altitude hold, 360° flip, speed selection and headless mode. It has a number of automated flying procedures as well as an emergency button in case something goes wrong, making the device less intimidating. In addition, its bunch of LED lights allows night sessions. 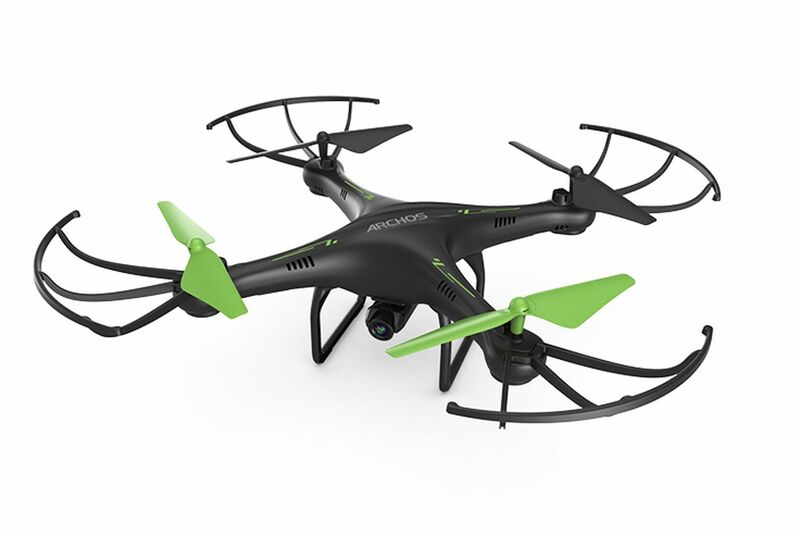 The ARCHOS Drone achieves burst speeds of 7.7 m/s horizontally and 1.6 m/s vertically. It reaches its maximum speed in a few seconds and raises an altitude of up to 50 meters very fast. Its 1 MP built-in camera is a real attraction. It takes all kinds of aerial videos, coming in an HD resolution of 1280 x 720 pixels that can be stored in its 4 GB’s Micro SD card (included) and, even better, broadcasts in real time on a smartphone. It flies during a session from 7 to 9 minutes, making it the ideal companion for beginners. Spare batteries will also be available for purchase for the ones who wish to become drones enthusiasts. The ARCHOS Drone comes with its own Controller, enabling a dedicated WiFi liaison and ensuring a perfectly stable connection. It can also be easily conducted with the ARCHOS Drone Remote app preloaded on a smartphone running Google Android 2.2 and later or Apple iOS 5.1.1 and later. The ARCHOS Drone will be exhibited on ARCHOS’s booth at IFA 2016 (Hall 25, Booth 206). It will be available for purchase in October 2016 on www.archos.com and through its distribution’s channel worldwide for £79.99 (UK).